Are you a paddle enthusiast? Whether it be paddling around a quiet lake, or perhaps you prefer letting someone else do the hard work while you dip your toes in the water? Here at NeedlePaint, we have designed a new collection of needlepoint canvases featuring some very handsome and colorful paddles. Our needlepoint pillow, flask, wallet and belt are all available as needlepoint canvases for you to stitch, or if you prefer we’ll do the stitching for you. Remember, when you’re finished stitching your needlepoint canvas, we are here to help you with our needlepoint finishing services. 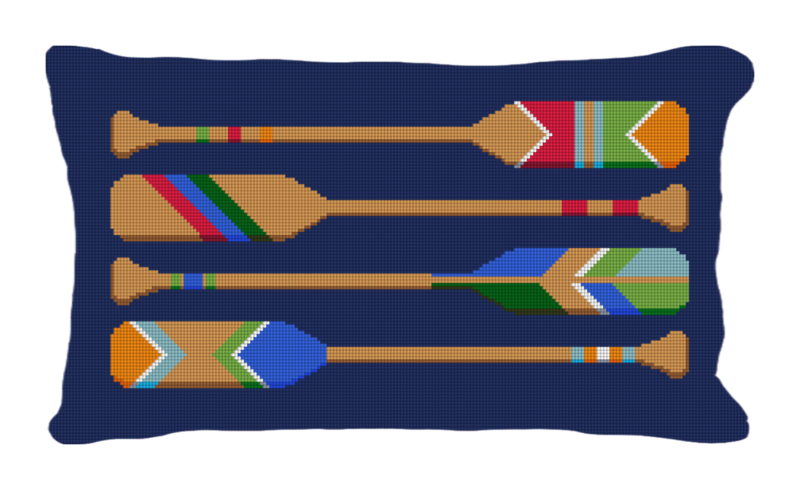 Our Preppy Paddle needlepoint pillow canvas will look great in your home, summer home or cabin. When you have completed stitching this needlepoint pillow canvas, we would be happy to help you turn your canvas into a pillow, with our pillow finishing service. “Exploration and Recreation” — Needlepointing and paddling are both great activities. Whether your exploring a new stitch or taking a new direction on the lake . . . . quietly stitching a new needlepoint canvas, and paddling through nature, are both relaxing activities you’ll be sure to enjoy. 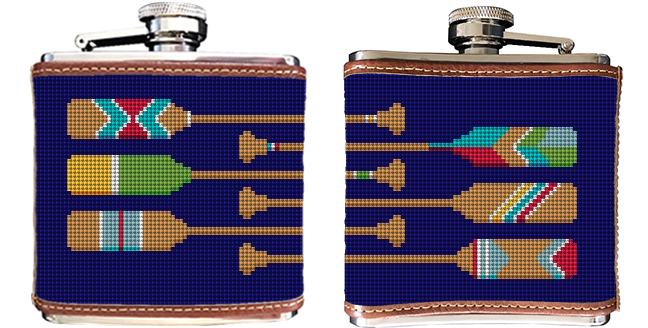 Our Preppy Paddle needlepoint flask canvas, will be the perfect accessory to stitch for yourself or as a unique gift idea. After stitching your needlepoint flask canvas, we do offer a flask finishing service complete with leather and a metal flask. 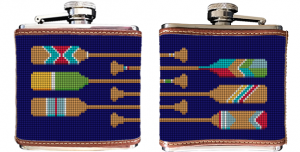 Don’t forget to slip this new flask into your picnic basket on the next rowing adventure! “Tranquility at its finest” — Stitching a needlepoint canvas, creates a tranquil “zen like” feeling, similar to slowly paddling and gliding through the water of a crystal clear lake. Notice the intense colors of the thread, or the vivid colors in nature, not to mention the quiet and subtle sounds of both activities (or lack there of) can be oh, so soothing. You’ve spent the day fishing among the beauty of nature, but still haven’t caught any fish? Not to worry, there is a grocery store down at the base of the mountain. Simply pull out your new Preppy Paddle needlepoint wallet and pay for those little beauties, no one will be the wiser. After stitching your Preppy Paddle needlepoint wallet canvas, we do offer a wallet leather finishing service to turn your beautiful stitched canvas into a wallet. You’ll look great on your boat wearing this belt! 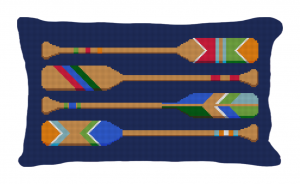 Our Preppy Paddle needlepoint belt canvas is the perfect project to stitch for the paddle enthusiast or for yourself. When you have completed stitching this needlepoint belt canvas, we would be happy to help you finish your belt, with our belt leather finishing service. Remember we are here to help you with all of your needlepoint needs! Whether it be providing you with a canvas to stitch, a finished product or to complete your stitch canvas with our finishing services. Feel free to contact us with any of your questions at: info@needlepaint.com.